For the past year I’ve been working with a coach at work. It’s impacted my professional life as well as my personal life. When I mention this to colleagues and acquaintances, most say, “I want a coach.” Some say it would be great to have someone telling them how to solve work problems. But that’s not what happens. Being coached is hard work. The person who has the answers is me, and my coach works hard to get me to think about the problem and possible solutions. After a year, I’m almost at the point where I can identify the issue and almost have it identified or resolved before we begin a coaching session. Coaching helps me with the complexities of today’s changing environment. For example, I started out learning that directing a team is the way to go. Today, however, the emphasis is on collaboration and negotiation. Before coaching, I established the agenda of team meetings. Now, I ask team members what should be on the agenda. My role is as a facilitator. Everyone is able to bring issues to the group and seek input from all. That doesn’t mean that we are all in agreement. The phrase we use is that we reach an approach or solution through collaboration, but we aren’t striving for consensus. One of the best aspects of coaching for me is that it provides me with an opportunity to step back, reflect and reprioritize. Otherwise, sometimes I don’t think I would do this, and yet I need to. When I do it, I may realize I’m off course, and need to recalibrate. I realize that not everyone has the opportunity to be coached. 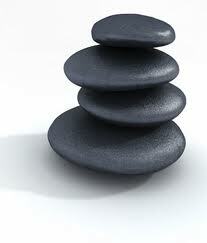 But we can all benefit from taking time to step back, reflect and reprioritize. 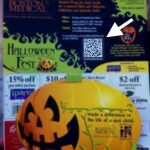 Have you seen QR codes in magazines and newspapers or on signs, buses or business cards? Do you know what to do with them? They are one of the most popular types of two-dimensional barcodes. QR is the abbreviation for Quick Response, as the creator intended the code to allow its contents to be decoded at high speed. Users with a camera phone equipped with the correct reader application can scan the image of the QR code to display text, contact information, connect to a wireless network or open a web page in the phone’s browser. All of the newest generation smartphones come preloaded with QR code reading software, including the iPhone and Android. 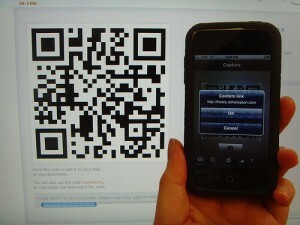 A free app or software can be downloaded quickly and easily to enable QR code reading in slightly older smartphones. During the last six months of 2010, QR code scanning increased 1,200 percent across North America, according to a report from mobile payments and marketing company Mobio Identity Systems. See the QR code in his poster? It takes people to a page that gives more information than a poster could hope to. A person would just use a QR reader on their phone and the link would open in their phone’s web browser. By adding a QR code to a marketing campaign the brands are creating interactive media. They can deliver video, Web properties, digital coupons or even sell their products directly through a formerly static media. Have you used a QR code? If so, content did you receive? Twitter turned 5 on Monday. Today it has 200 million users and is a broadcast channel for major news events, including the plane in the Hudson River and the tsunami in Japan. It’s become a communications tool during political uprisings. When I’m communicating I write my headlines and subject lines of emails so that they are concise and that the meaning is clear. I think about what I would say if I had to tweet the article. If I can’t quickly identify the purpose of the piece, it needs to be rewritten. Twitter may not be for everyone, but its lessons offer solid foundations for effective communications. 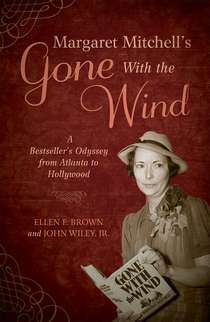 Ellen F. Brown was not a Gone with the Wind fan until about three years ago when she interviewed John Wiley Jr. about his collection of GWTW memorabilia. “He regaled me with stories,” she said of Wiley who had been collecting since he was 9. The more they talked, the more Ellen fell in love with the book. They decided they wanted to tell the story of the creation and marketing of the book. The two quickly found an agent and a publisher and realized that 2011 would be the 75th anniversary of GWTW and so they researched and wrote, Margaret Mitchell’s Gone With the Wind: A Bestseller’s Odyssey from Atlanta to Hollywood. GWTW was an overnight international bestseller when published 75 years ago, and one million copies sold in the first six months. The book won the Pulitzer Prize and was nominated for the Nobel Prize. Ellen shares in the book how fame swept over Margaret Mitchell and her husband. They came to terms with it by deciding not to move or change their phone number. The mail came in shifts to their home because there was so much. Ellen’s book covers so much of the history because she and her co-author had unprecedented access to thousands of Mitchell’s papers. They found answers to questions that gone unanswered for decades, including what Rhett Butler’s middle name was. Note: Yes, I bought the book. And no, I’m not telling you the answer. A good story is not written; it is rewritten. And often, many times. She notes that most of us overwrite so sometimes she will eliminate 10 percent of her copy. “It does wonders for the tautness of the piece,” she says. What items are on your writing hit list? Between Thanksgiving and the New Year I read a mystery series by Donna Andrews. The books, starring Meg Lanslow, were a fun, quick read. Imagine my delight when I discovered Donna would be speaking to the Sisters in Crime Richmond chapter. She is always asked how she goes about writing but before she shared her process she stressed that it differs from author to author. Donna uses an outline as a starting point. “Then I challenge myself to write something even better,” she said. She begins with a seed. “It could be a unique way of killing or someone who needs to be killed.” From there she looks for humorous situations that also have tension. An outline enables Donna to not write sequentially. That way if she is ready to write a particular section or has the dialogue ready to go, she can work on that. 2) She is nervous about the pending deadline. Sometimes she gets stuck and on those days she will read something on craft, such as Robert McKee’s “Story: Substance, Structure, Style and the Principles of Screenwriting,” which is often referred to as the screenwriters’ bible. Donna also creates a spreadsheet determining how many words she needs and how many days she has to write it. Then she’ll figure out how many words she needs to write each day. She’ll discover that she has to write 1,000 words each day for the next three months, for example. “That’s doable,” she said. She does this because at the end of every day, she said, “You can spend so much doing things that feel like writing but aren’t.” This includes research or finding the right word. Fundamental trends are driving the growth of public relations, says John Paluszek, APR, Fellow PRSA and chairman of the Global Alliance. He recently spoke to senior practitioners during a morning coffee before speaking to the Richmond PRSA. John Paluszek discusses public relations trends with senior practitioners. Paluszek, senior counsel with Ketchum, has counseled on corporate social responsibility and sustainability for severaldecades. He said that the demand for PR services continues to grow. “Almost all institutions now recognize the need for PR,” he says. This is critical, he says, since PR professionals help to manage the interaction between the company and its stakeholder. The messaging evolution has gone from delivering the message to what should the message be to a company asking what it should do. The demand for PR services is happening all across the world. He cited MEPRA or the Middle East Public Relations Association as evidence of the need for PR services. His firm has six offices in China, which he said he could not have imagined 10 years ago. “The world is changing and PR people are a part of it,” Paluszek says.